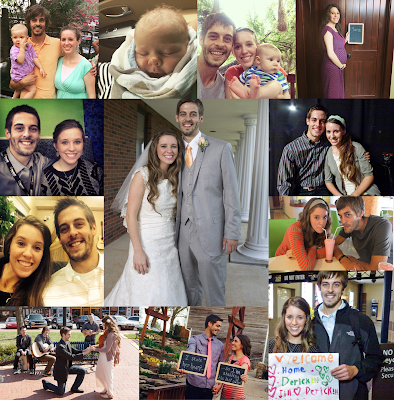 Two years ago, on a sweltering June day, Jill Duggar and Derick Dillard became man and wife during a beautiful ceremony that was attended by 1000 of their closest friends and family members. After spending one year in Northwest Arkansas, where Derick worked as an accountant for Walmart, the Dillards--along with their infant son, Israel--moved to Central America to pursue full-time missions. Jill and Derick had their first phone conversation in March 2013. Derick was in Nepal doing humanitarian work, and he and Jim Bob Duggar were prayer partners. It was Jim Bob who, upon realizing that Jill and Derick had similar life goals and personalities, set the two up. Starting in August 2013, Jill and Derick began communicating via text, email, Skype, and telephone. In November, Jim Bob and Jill flew to Nepal for two weeks. After seeking guidance from the Lord and counsel from Jim Bob, Derick asked Jill to enter an official courtship. Derick returned home to Arkansas in January 2014, upon completing his two-year term in Nepal. At the end of February, he asked Jim Bob's permission to propose and then popped the question to Jill on March 29. So they moved to Central America for good? A prayer partner is simply two people who come together to pray with each other and/or for each other. The Bible says in Mathew 18:20 "For where two or three gather in my name, there am I with them." My prayer partners have always been someone who is older and wiser than I am. It allows them to guide you in prayer and for them to wisely keep you accountable. They can be in constant prayer over you in times of struggle such as missionary work and praise the Lord with you when He answers a prayer. Happy Anniversary and may God always bless your family! I thought they said they were moving back this summer? So much for "full-time mission." Yeah, they said they are coming back in July. I don't think they ever said they were moving there for good, they simply said it was a long term mission, which in their case means 9 months. "1000 of their closest friends and family members" I doubt they knew all the names of all their guests. Nobody has 1000 CLOSE friends and family members. What is it with these huge weddings? Is it a competition? "I had more guests than you had at your wedding .." Oh come on! It sounds a little crazy to those of us who haven't been on tv, traveled a lot, and had the opportunity to meet a lot of people, but the Duggars have had those opportunities. Let's not read motives into other people's choices when we really have no personal knowledge. Just makes us look petty, jealous, and ignorant. When families have 10+ kids it's pretty easy to get to 1000. Why the criticism re: number of guests? Eight kids in my husband's family, plus numerous extended family of his, plus all our parents' friends and neighbors and coworkers, and we came nowhere near 1000 people on our wedding guest list. More like 150. There is a big difference between having 1000 friends and familymembers, or having 1000 CLOSE friends and familymembers. I may believe they actually have that many friends, but I don't believe they are close to all of them. There is no way anyone can maintain a close and personal relationship with over a 1000 people. 8 siblings vs 19 Siblings ..
Plus You and Your Husband May not have wanted a huge wedding and not everybody can afford it but it's not our job to knock those who do. The Duggar Family Alone is probably 200 Ppl. Many blessings upon you and precious Israel. We are so happy life is good for you and looking forward to your return to Arkansas. Congratulations on your 2 year anniversary! May God continue to bless you and baby! Happy 2nd Anniversary Jill & Derick! Congrats Mr and Mrs dillards. So happy to see who you have grown in the past few yrs. They became husband and wife. Not man and wife. Congratulations to them! I agree with you. I hate that antiquated language. What ev, its just a saying, no need to be so literal, lighten up, good golly! What's the matter with man and wife? It's a man and his wife. Unless you mean a woman and wife? To the last commenter: man and wife makes it look like the man is the only one who counts and the woman is only worth mentioning as his wife, as if she had no other value. He is his own person and she is his wife. The expression was originated when women had no rights and were their husbands' property. Instead, if you say "husband and wife" it puts them at the same level, how it's supposed to be. Neither is more important than the other.